Yavneh is 75 years strong and we estimate that over 6,000+ young Jewish campers have enjoyed the Yavneh experience over the past seven decades. Our alumni family spans the globe with many people – staying in touch from as far away as Israel and Europe. Today, we have many second generation and several third generation campers and staff members. The longest continuous participant has been with us over 30 years. We know that the friendships that people develop at camp last a lifetime and it is our hope that through this website, our alumni newsletter, and our alumni events you will be able to stay connected with these friends – wherever your life’s adventures may take you. Keep in Touch! Sign up for our Alumni Guestbook and Like us on Facebook! The 40s were tumultuous years. Our country was at war, our boys were in the Service, and we at home were depressed. It was during this period of time that the idea of Yavneh was conceived in the minds of Dean Louis Hurwich and Mrs. Leah Hurwich of blessed memory. Louis Hurwich was obsessed by two great problems which eventually found their solutions in the creation of Camp Yavneh. First, he wanted to extend the usage of Hebrew language beyond the walls of the then Hebrew Teachers College; and second, he wanted to instill the love and observance of Judaism in those students who lacked this for or another reason. In addition, he hoped to create dedicated teachers who would perpetuate this ideal in our schools and colleges. It was Leah Hurwich, however, who sought to combine all of the above with regular camp activities, so that both the mind and body would benefit from a summer program. In the fall of 1943, Dean Hurwich pursued his dream and gained approval for a Summer School and Camp from the Board of Trustees of Hebrew Teachers College. He enlisted 37 founders, each of whom contributed $1000 towards the establishment of the camp. Among the founders were the initial benefactor and first corporation President Albert Goldman, Eli Cohen, who was already known for creative and innovative Jewish camping and lent much guidance to the project, and the New England Women’s Association, who were already generous contributors to the College. Camp Hickory in Northwood, NH was purchased for $18,000. The name, “Yavneh,” was taken from the great historic symbol of Jewish survival. And so, in the summer of 1944, Yavneh was born! It was extremely difficult to secure qualified counselors during the war years, Not only did our staff have to excel in sports, swimming, arts and crafts, music, etc., but they all had to be proficient in Hebrew as well. Where could the Hurwiches go in their search? There were two options open- The Yitzhak Elhanan Yeshiva and the Jewish Theological Seminary (JTS). And of course, there was also our own beloved Hebrew College. From these institutions, they selected the finest group of counselors for the first season of Camp Yavneh. They were mature, experienced, and dedicated, and all spoke Hebrew fluently! These young men and women (from the Seminary) lent a hand to any task, no matter how menial. “We were all pioneers that summer doing whatever had to be done,” remembers Dena Micley, our very efficient and conscientious camp secretary. We took courses in the summer because Dean Hurwich had allowed those with excellent grades to skip a semester in the Prozdor, provided work was made up in camp. We studied in the Sukkah and under the shades of the pines and we really learned our material well. Rabbi Wind was an inspiring teacher, especially at 6 in the morning! The ruach in camp, especially in the chadar ochel, was unbelievable. We sang and sang while waiting for the food to arrive. Mollie Stein Glanz recalls the following: “The songs we sang then were different from those of today’s repertoire, Our songs were those of the Chalutzim, of the rebuilding of the Land of Israel. There was no “Jerusalem of Gold” or the songs of the later wars.” The summer that Yakov Rosenberg was Music Director was wonderful. He was a student at JTS and had a beautiful tenor voice with which he led singing and Shabbat services. Our favorite recreational activities were rowing, swimming, and nature studies. The camaraderie among the staff, teachers and campers was incredible. Many of the counselors who were students at JTS went on to achieve prominence as rabbis, philosophers, teachers, and authors. The caliber of personnel at Yavneh was always first rate; a tradition that, to Yavneh’s credit, has continued through to the present. Dr. “Dock” Weinstein, z”l, was our head swimming counselor. How the girls adored him as he stood on the dock wearing his famous white baseball cap. He made an unbelievable effort to speak Hebrew at all times during his instruction to our campers, and believe me, this was an arduous task. Frances Levin was Hurwich’s right hand. Her organizational and secretarial skills behind the scenes back in Boston, before and after the camp season, were outstanding. We all loved her and looked forward to her visits to Yavneh. After four seasons, the Hurwiches (due to illness) had to retire from camp, and Frieda Shore, z”l, took over the helm in 1948. Frieda ran a “tight ship.” She knew the whereabouts of her staff at all times. Camp continued to thrive, and we all loved and respected Frieda and Mordecai, of blessed memory, and the girls. Camp was full at 90 campers and we were truly a family where you knew everyone (and everything there was to know about everyone!) The bunks were called by the names of cities in Israel. None of us had traveled to Israel as yet in those days, and so Yavneh was like Israel for us. Eilat, Tzfat, and Ein Gev were the girls’ bunks; they followed the path to the water front. These architectural marvels, graffiti covered, still stand today but are used for the boys. The boys bunks, Tel Tzofim, Etzion, and Afikim are currently used for boys as well. “Tel Tzofim” – now called the “big white bunk” always housed the youngest girls and we fondly remember the apple fights that were waged out front as the crab apples fell to the ground in late August from the old tree in front of Tel Tzofim. The Ackermans and other adult staff lived in the white house and the kitchen boys lived in tiny cabins (that are now in Zilch!) The “marp” today looks and smells much as it did then. The public buildings were much smaller. The Beit Am, later renamed “Hertzl” and even later torn down, was the single building for all camp gatherings. Even in the 50s, the Beit Am looked ready for demolition, but it served us well from early morning Shacharit Services (where boys and girls sat separately but with no formal “mechitzah”) through afternoon peulot of rikud and indoor sports, and well into the evening for the all-camp tachnit erev– evening activity. Major activities of the summer were a foreshadowing of the big events in the years to come. We had a shuriyada (later renamed zimriyah! ), a one day maccabiyada (later years, a full week maccabiah! ); but our Rikudiyada was much like our rikudiah is today. The dramatic productions, the camper play and the counselor play, were ambitious presentations that highlighted every season. Classes were held all morning, rain or shine, Sunday Through Thursday. And although almost every camper went to Prozdor, we received no credit in Brookline for our studies. My favorites on the teaching staff were Rav Regeur, an extremely dignified, yet short and very round man who huffed and puffed around the table in our outdoor classroom, cajoling us, and then admonishing us to do better, read louder, study harder, and then later in the day would stop at our tables at lunch to make sure we were eating enough. And Mr. Hillel Price who taught Hebrew in the morning and “hitamlut” in the afternoon, long before anyone had invented the term aerobics. Our Hebrew classes were intensive, rigorous, and yet fun. Because Hebrew was the mother tongue of Yavneh- we spoke only Hebrew and heard only Hebrew in all public settings. All plays were performed in Hebrew. All announcements on the ram kol, preceded by “hakshivu, hakshivu” were always only in Hebrew. You never heard any English word spoken out loud, outside of the bunks, so we all learned to speak Hebrew fluently. On Friday morning the frantic pace of the week slowed as we began to ready ourselves for Shabbat. We were allowed to sleep an hour later and, after breakfast, made sandwiches for our outdoor picnic lunches so that the chadar ochel could be prepared for Shabbat. We cleaned our bunks as though the Messiah was actually going to visit. We shlepped our mattresses outside to air in the sun, used pine sol to wash the floors and the rafters and then began to prepare ourselves for the major event of the week- Erev Shabbat. The girl’s area was always chaotic as we trooped to the kitchen to beg Izzy (the cook) for sugar. We then stood in line at the sinks to “starch” our petticoats and then pinned them up to dry on the screened walls of the tennis courts. Watching the flies buzz around our underwear was part of the pleasure of our Friday afternoon rest hour on the mattresses still lying on the grass. We breathed in the smells of the pine sol drying on the bunk walls as we mused about who would ask us to dance that evening. Scurrying around late Friday afternoon, collecting still damp and very sweet horsehair petticoats from the tennis courts, retrieving a white blouse that you lent someone last week and combing out your curls that were still wet (no hair dryers in those days!) are all part of the wonderful memories. Fluffy-haired and balloon-skirted girls would parade to the flagpole peering and giggling and calling “Shabbat Shalom!” After a hurried mifkad and Tzedakah collection, we walked up to the grove for Kabbalat Shabbat Services. This outdoor Beit Knesset was up the path in the woods (near the current road by the Director’s house). This place is now grown over and has become woodlands once again, but I can still hear our soft voices chanting L’cha Dodi on those wondrous Friday evenings so long ago. Shabbat dinner was followed by amazing Shabbat Zmirot– the highlight of the singing was Rav Reguer getting up and leading Yismchu– he received a roaring ovation each and every Shabbat. Earlier, we had left our bunks for services- all lights extinguished. Our sneakers and white socks were waiting under our beds so that we could retrieve them quickly in the darkness and then rush to the tennis courts for the most exciting time of the camp week, Shabbat dancing. The boys would fly across the courts to ask us to dance, and relationships that would often last a lifetime began with a well rehearsed “Would you like to dance?” The pattern was the same every Friday night- one large circle with lovely Shayna Chashean, the dance teacher, in the middle. She uttered Shabbat Shalom Machaneh Yavneh, and all of us uttered back “Shabbat Shalom, Shayna” and so began the sounds of “histavevu, ” “paam achat bachura yatza” and all the dances that we had learned that week in Rikud. (Many years later in the 80s, as director of Yavneh I would greet the camp after the Kabbalat Shabbat Services with “Shabbat Shalom, Macheneh Yavneh” holding the image of Shayna and the tennis court in my heart.) Our feet clad in “Naalai Goomi” romped across the tennis court with our partners smiling and flirting. All too soon, Shayna would raise her hand and shout “Laila tov “Eilat” v’ “Tel Tzofim” and the groans and cries of the youngest campers sounded throughout the camp, as the boys and girls paired off and walked back to their bunks. Tripping over the tree roots in the Shabbat Darkness and fighting off the mosquitoes and begging your counselor for 10 extra minutes to say good night was all part of the magic of Friday night at Yavneh. We are flooded with memories of watching the candles melt wax on the sides of the tipped over benches as we sat for hours on the hard wood floor of the Beit Am, chanting Eicha on Tisha B’av and ending the long fast with delicious chocolate cream pie. Returning each summer, looking for our graffiti-scrawled names on the bunk walls now covered over by generations of names that were yet to come. Leaving each summer in tears begging the Ackermans to turn Yavneh into a year round camp, clutching our autograph books crammed with silly messages of nostalgia and wonderful prophecies of the years to come. The last breakfast on the last day of camp in those days was mournful, as Izzy, our beloved cook, came out of the kitchen to receive our applause and tributes for a job well done. He would hop up on the tables and sing in broken English “Camp is oiver, camp is oiver, and now we go home.” But we all knew Izzy was wrong. We may be returning to our parents and our winter lives, but it would not be till next summer, till we returned to Yavneh that we would be coming home! 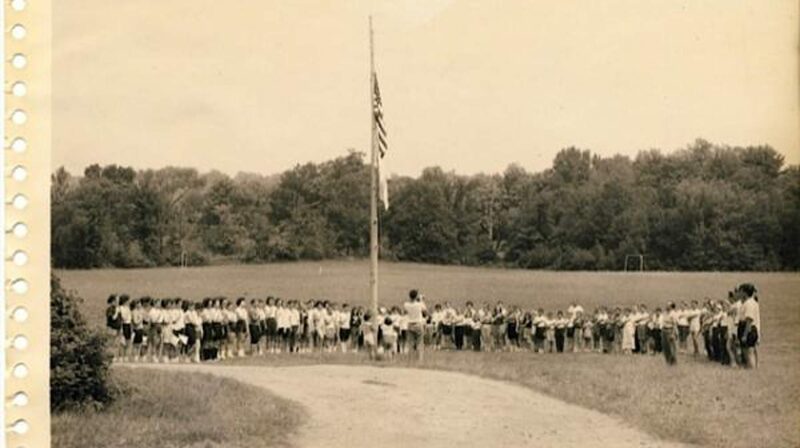 Camp Yavneh flourished in the 1960s more than ever had up until that time. 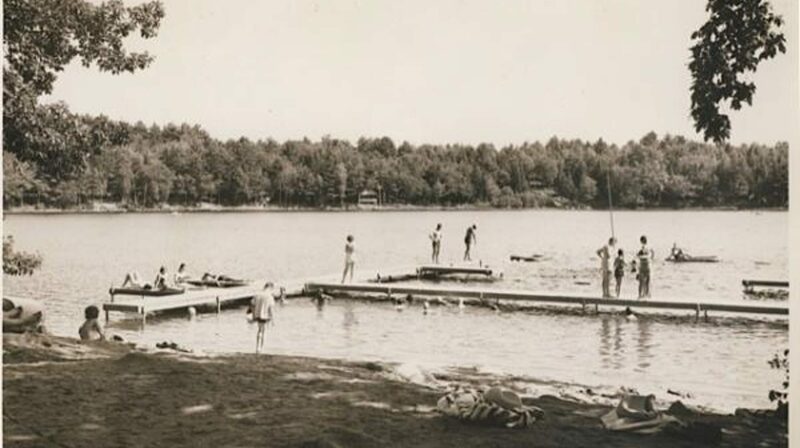 The decade was marked by the growth of the Camp’s physical plant, including new bunks and Ben Zvi, as well as an increase in its camper population from under 150 campers at the beginning of the decade, to 200 campers by the middle of the decade. Much of the physical growth of the camp can be attributed to a small group of committed, caring and generous community leaders in Boston, led by Mort Grossman and Marty Braver. The slogan, “Mort Grossman Moshiyanu, Mort Grossman Kaspenu” was chanted frequently during the decade. The growth of camp can also be attributed to its directors, starting with Baruch Levine, ending with Abraham Yanover, and with Moshe Avital for the largest part of the decade. Moshe brought with him many campers and talented staff from the New York area. The talented staff was the hallmark of the decade. Who can forget the talented array of musical directors- including Warren Bargard, Stanley Sperber, Joshua Jacobson, Jeffrey Labes, and Matt Lazar-their mark on music at camp is still felt to this day. In Omanut, the immense talent of Arie Lamdan graced camp in so many positive ways. Tzippi Krieger and Bryna Shore…The Berkowitz Brothers…Carmi and Adina Margolis (many of us still do “the Carmi” when trying to get water out of our ears after a swim)…Paul and Roz Schneid…Whitey and Ruthie Sheinhorn. The sports program featured many great leaders, including Les Krieger and Alan Fox. Competition with other Jewish camps, as well as Bob Cousy’s Camp Graylag, was an important feature of the sports program. Softball, Volleyball, Basketball, Swimming, Tennis. The decade witnessed Yavneh’s first victory in the Camp Tevya Tennis Invitationals. And of course, the educational and Hebrew component was strong and vital. The Chug study group of Prozdor students taking summer courses at camp was large. Fine educators such as Dr. Mikliszanski, Rabbi Reguer, Dr. Egozi and others will always be remembered. 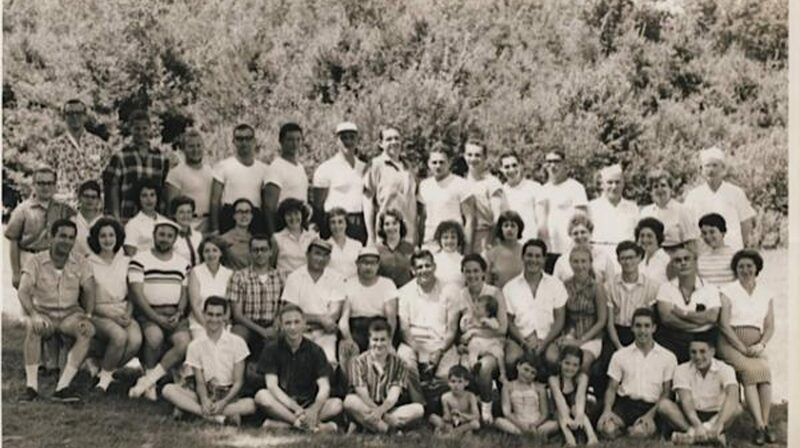 More than anything, the Yavneh of the 1960s is remembered as family. All who went there at point during the decade felt as one family. That family continues to the present, as many of today’s campers and staff are children of campers of the 60s. Even our current director, Debbie Hurwitz Sussman, was a camper of the 60s. 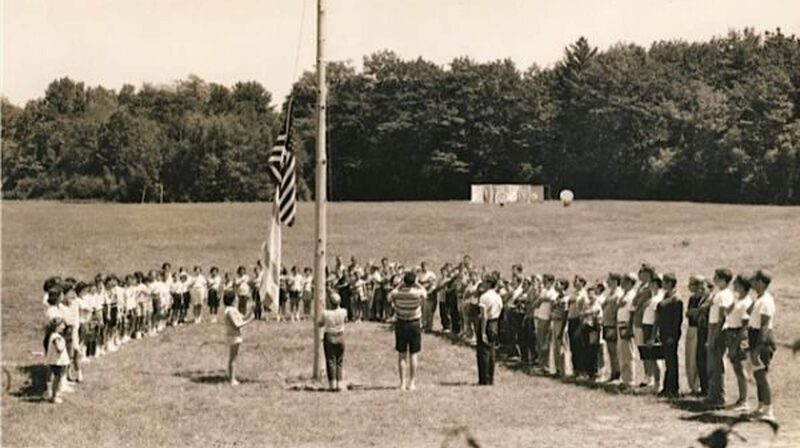 This continuity is a reflection of the strength and significance of Camp Yavneh to the campers of the 60s, a strength and continuity still felt today and which we hope will continue and flourish for the next 60 years and beyond. The 70s represented an era of great prosperity for Camp Yavneh. The population of the camp grew, and Yavneh flourished in many areas. The decade began with Abe Yavnover at the helm. Although Abe’s tenure only lasted until the end of the ’71 season, he left a lasting impression nonetheless. Who could forget the sight of Chef Abe tossing burgers and hot dogs at one of his beloved weekly BBQs? For his last summer, Abe made two very wise personnel decisions. Billy Lichtman, who spent several summers training at Camp Tel Noar, was signed as a free agent to Rosh Banim. Billy’s calm demeanor and reasonable approach enabled him to survive working with six directors through his over twenty year career at Yavneh. Abe also hired Rabbi Mel David, who served as Rosh Kerem, Rosh Maccabiah, teacher, and spiritual leader through the 70s and 80s. On Friday nights, the Chadar Ochel literally rocked when Mel led Shabbat Zmirot. Dr. Michael Libenson took over as Director in the summer of ’72 and remained in this position for six years. A well-respected psychologist, Mike was known at camp for his care and concern for everyone. He prided himself on being able to identify each and every camper by name. Mike also instituted an invaluable innovation, the infamous tornado drill, during which everyone had to duck under the tables in the Chadar Ochel. Unfortunately, it was during Mike’s tenure that the old Chadar Ochel exploded and burned to the ground, on Tisha B’Av in the summer of ’73. It is amazing that the summer continued without missing a beat as the camp ate meals under a tent on the tennis court for the rest of the summer. Mike’s staff was intensely loyal to him, starting with his right hand man, Jay Kroopnick, who helped hold Mike up (while Matt Green and Joey Rabinowitz held Jay up) every day. Avi Teken followed Mike as director, for three summers to closeout the decade. Avi filled the camp like no one had ever done before; the camp’s population rose above the 240 mark! Of course, a hot shower was particularly hard to come by. During Avi’s tenure, they were always safe from attacks by unwanted visitors. Trained in the Israeli army as a paratrooper, Avi himself led the Yavneh Defense Forces. The success of the 70s lay with several key individuals who returned year after year after year to serve in a variety of important positions. The Agam was well-run during the 70s, mostly by two extremely capable and strong women, Frieda Lach Dahukey, of blessed memory, and Susan Unger Green. It was safe and productive waterfront, and the swim team met with great success year after year at the Naticook Invitational Swim Meet. Under the helm of Linda Lichtman, the boating program, especially sailing, really caught wind with the introduction of sunfish. Davis Wolf followed Nathan Kaitz as Rosh Sport for most of the decade and continued an upward swing in athletics that saw Yavneh reach, in the mid-70s, a level of success in inter-camp competition that was unmatched in the camp’s history. 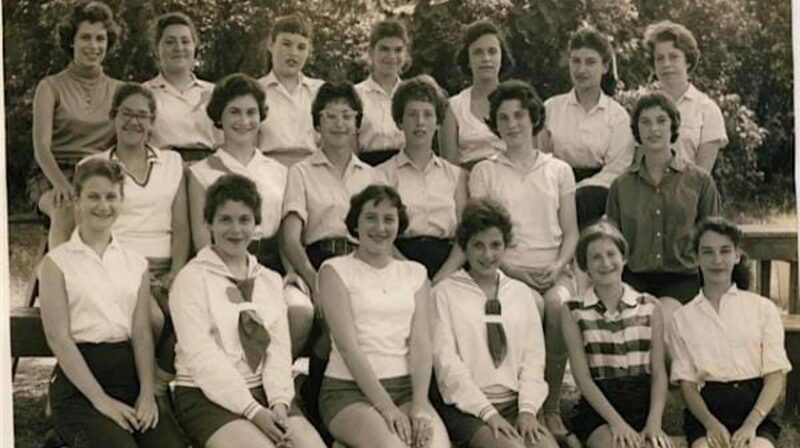 With noted athletes like David Frim, Craig Foreman, Kenny Perlow, Billy Weinstein, Jeremy Rabinowitz, Shira Kessler, and Lynne and Ellen Korelitz, Yavneh’s teams were feared (and not just because they spoke Hebrew on the field)! Under the tutelage of Rick Kaitz and Matt Green, Rachel Levine was a shoo-in to win the Tevya Singles Tennis Tournament. 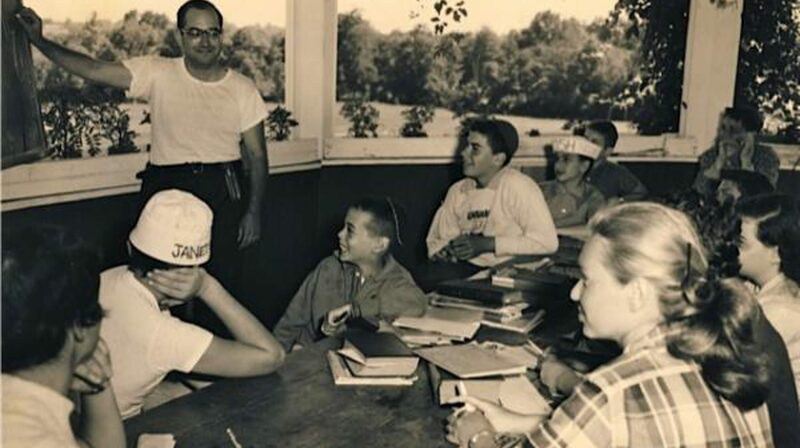 Hebrew language continued to be the “raison d’etre” of Camp Yavneh during the 70’s, and two distinguished educators were among those who took turns as the educational director. Rabbi Pesach Sobel’s creation of the daily “Milat Kesem” was one of his many accomplishments in this position. Menachem Rotstein, of Carmel Trio fame, also served admirably in this role for several years. Yavneh’s exceptional musical tradition was carried forth through the decade by several talented musical directors, such as Jack Kahn, Meir Minsky, and Bob Pilavin (now Rabbi -who never went anywhere without his keyboard…and an Elton John songbook). In the early 70s, the camp awoke to Jack Kahn’s voice on WYAV, “ja’kol ha’iviri shel Northwood rabati“. In addition to his exploits in music and radio, Jack co-founded the Yavneh Liberation Front (YLF) with Ed Fistel, to protect Yavneh from tyrannical forces. Alan “Flash” Gordon and Mike Ross were two drama directors who worked late into the night planning and producing one unforgettable performance after another. Rina Brick, Barvara Wolf, and Gail Kroopnick were among the dance directors who pulled off Rikudiot, in which the male counselors looked nimble. Perhaps the most important person to begin working at Yavneh in the 70s was Doug McLean, who became director of maintenance under Mike Libenson and remained dedicated to his position and to camp until his death in 1994. Doug put his heart and soul into every new building that he built and took pride in the beauty of camp. It seems that there were many families that provided the camp with an endless supply of campers. 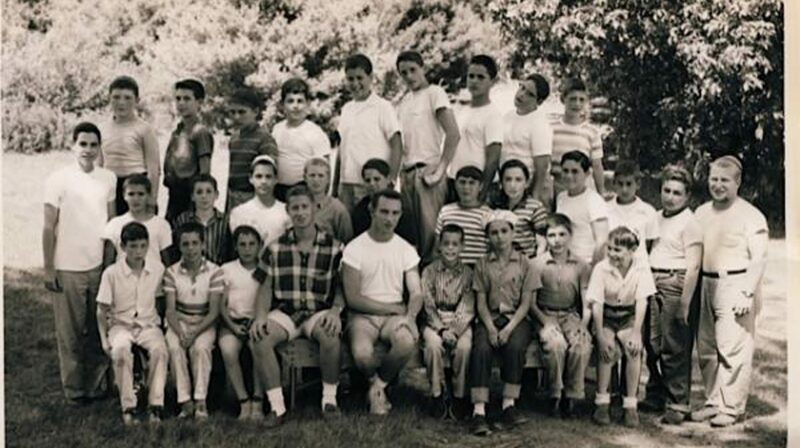 Some of the families who had at least four members represented at Yavneh during the 70’s included: Bailen, Berger, Caplan, Foreman, Harris, Lake, Unger, Wald, and the Weinsteins of Albany (Dave was really only 15 when he started camp, even though he already had a full grown beard). 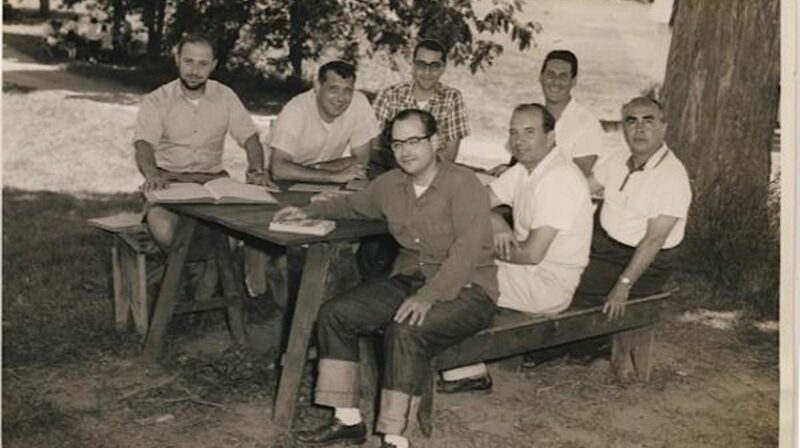 Camp Yavneh and its mission have been central to their lives. These people, in turn, have enabled camp to continue to fulfill its vital mission. Shoshana Marcus, Margie Berkowitz, Avi Teken. Hot air balloon rally. Meteors falling from the sky. Monster emerging from the archaeological dig. Michael Jackson look-alike. Pease air force base band. Arab diplomat in helicopter. Hypnotist. Helicopter/fake ax murder (a.k.a. Juan Valdez and Shoshana’s return!). The airplane? The police arrest at the Deerfield Fair. Mel returns. Betty chases Benjy through the Chadar Ochel. Towny raids. The Walls of Jericho. Raid on Entebbe. David Hezi, Mel David. Haim Casper. David Wolf. Aaron Kula. Bon Pilavin. Captain Bob. JV softball defeat of Bauercrest in 1981. Kerem 1985 Intercamp Basketball Tournament winners. 1993 intercamp Basketball winners. Gunne Sax. Porch collapsing. Leva’im. Carnivals. Cotton candy. The Northwood circus. Roller-skating. Square Dancing. Moving Ben Zvi. The new office. The old office. Building Beit Am. The amphitheater. Beit David. Luke. The King and I. The Sound of Music. Peter Pan. I Never Saw Another Butterfly. ALS practicals. Yavneh’s 45th anniversary – where are the campers? Birthday Bowl. Parsha Players. Fun yaks. July 4th parade. Take a Le Shake Break. Hoya. Yehuda Hoy. Arts festival. Banquet: Disney, Hawaiian, Love Boat, Hollywood, Olympics, Yom Kova, Yom Larry Bird. Tai Kwon Do. Maccabiah mascots. Sheket Bevakasha wars. Yom hooledet sameyach l’Reuben Beiser v’Harvey Mamon. Movies in the Chadar Ochel. Wacky Olympics. Dizzy Izzy. The Apache relay race. Sadie Hawkins dance. The bullfrogs at night on the agam. Skinny-dipping. Herman the turtle. The night the male and female counselors switched bunks. The counselor banquet. The last night social. The words, “Machaneh Yavneh” fading in candlelight and moonlight on the agam. Doug. Sargeants’ Camp. Mystery trip to the Newington Mall and then Canobie Lake Park. June crew. Overnights. Israeli dancing. S-H-A-B-B-O-S-C-L-U-B Shabbos Club, oh yeah! Hakshivu, hakshivu na. Barbara Streisand na l’vo l’misrad. Electives. Mashiach, Mashiach, Mashiach, ay, yai, yai, yai, yai, yai. Avi Zablocki, Rosh Banim in 1968, returned for many years as a moreh and spiritual force at camp, not to mention Kef v’gamish. Lights on the basketball and tennis courts. The new screen doors. Tetherball. Walkie Talkies. Where are the paper towels? Leach fields. Rug rats. Banim banim. The new girls’ shower house. The showers in the girls’ white bunk. The visiting cows. The hike down the back road of camp. The new Kerem Lounge. Hotel Yavneh. Purple paint. Sutterbutt floor in the chader ochel. The trials. Fishing in the canteen. The darkroom. Mikveh in the agam. John Upham took over the kitchen. Where are all the cubbies? Fire drills. Clogged toilets? Exploding sinks and showers. Sleep-ins. Shmira. Curfew. Camp America. Safam. The Brody Family (da, da, da, da, da, snap, snap). Water Country, water country, water country, have some fun! Rocketry. Windsurfers. Soccer camp. Basketball camp. Trip days. Sport days. Zimriyah. Rikudiah. Maccabiah. Sifriah. Swimming excuses. Zoog time. The 1990s. The physical changes to camp started slowly, as we all boasted about the new “screen doors on the Ben Zvi” in ’91. In ’92, a new shower house was constructed for the girls (this one, for some reason, even closer to the Boy’s area!). By ’95 many bunks were expanded to accommodate the growing camper population, and the Kerem girls that summer were the first Yavneh campers to have showers in their bunks (which was exciting until they discovered that they were responsible for squeegying the floors during nikayon!). In the later 90’s as enrollment continued to increase, major improvements noticeably enhanced the camp, including the creation of a brand new Omanut center (with room to do much more than just gimp! ), and the addition of a bigger (and easier to secure) canteen (now known as “Kolbo,” and while you can still order your staples like Twizzlers and Rolos, you can now enjoy slushies as well! And great Yavnehwear, too!). There were also renovations to the Beit Am: a separate ping pong area, a separate closet for AV stuff and band equipment storage, new microphone,s and speakers, all thanks to Joel Sussman. 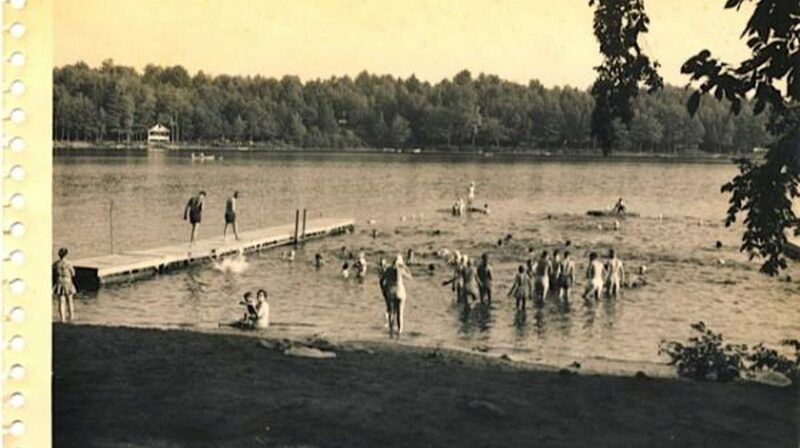 There were facelifts for the succot, the construction of a new office (turning the old office, which was once the new office – into what is now known as Beit Rachel) and many other upgrades that improved the physical condition of camp. The biggest “public works” project at Yavneh ever was The Big Dig, which at the time mirrored the finishing of the Big Dig in Boston. All the fields were torn up and a new septic system was installed. On top of all that were 2 new baseball diamonds, a new enclosed sukkah, an amphitheater- Tzippori, and moving mifkad and the white sukkah. We also put in a swings area and built a new basketball court. Wow!! 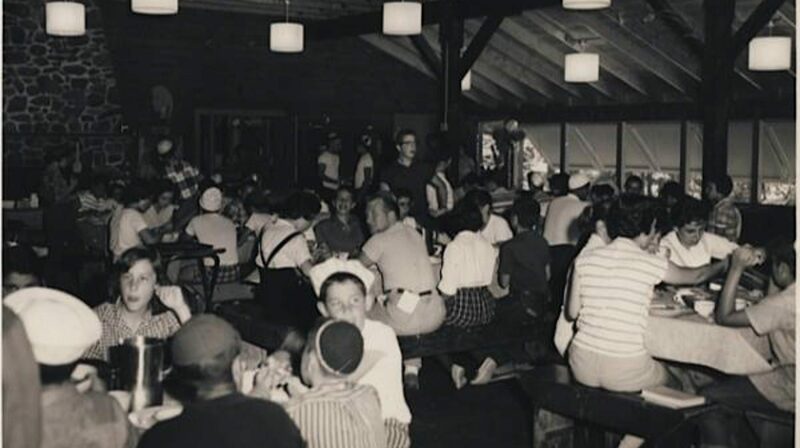 Another notable improvement to camp in the 90s was the transformation of the Chadar Ochel, both in space and in food! While the renovations were subtle at first with the painting of the old splintering floors to a color that we affectionately called “Sutterbut,” the Chadar Ochel walls were eventually expanded, making space for additional tables (and even some space to walk in between them, which also improved our standing with the fire department), as well as a salad bar, a bagel bar, a pasta bar and most importantly, the creation of YFS (Yavneh Food Services), led by John Upham who worked at Yavneh for 10 years. From the beginning of the decade to the end, the camper population grew from 170 to 300. Kerem ’91 had 20 CITs, and by 1999 the average Kerem had 40. While the numbers grew and the skyline improved, the core, the nefesh, of Yavneh always remained the same. Throughout the 90s, new generations of Yavneh campers and staff, many of whom were 2nd and 3rd generation from their families, carried on “Masoret Yavneh” while also creating new traditions with boundless ruach. Zimriyah has been a favorite Yavneh tradition since 1962, however, during the 90s the Zimriyah Bar was raised with the addition of hand motions, “shtick,” professionally made Aydot t-shirts for Arayot and up only! ), an annual Kerem procession, and event the crowning of Melech and Malkat Zimriyah (a coveted award created in 1995). Starting in 1990, KTV became the most anticipated peulat erev of the summer, with a close second being the Annual Safam & Sons Concert – which started in 1991 and played to a sold-out Ben Zvi for many summers! Another tradition started (or revived) in 1991 was the Kerem Play. Throughout the 90s, campers and staff have enjoyed such Kerem productions as: I Never Saw Another Butterfly (K’91), Who Shot Mr. Scott? (K’92), The Dybbuk (K’93), Radio Days (K’94), Peter Pan (K’95), Jerusalem 90210 (K’96), Fiddler on The Roof (K’97), Bye Bye Birdie (K’98), and Damn Yankees (K’99). The 90s also brought about the tradition of having a theme for the banquet on the last night of camp. Under the creative leadership of Estelle Gomolka (who has been at Yavneh in one devoted capacity or another for 40 years!) the Chadar Ochel was transformed for one night each summer into a Hawaiian Luau, a Three-Ring Circus, The Olympics, Hollywood, or the Hard Rock Cafe. While the tradition of counselors meltzing the banquet continued, now they had to dress accordingly to them and perform an original song! With a growing camp population, Yavneh was bound to gain some campers who were actually good athletes (as opposed to those who were only good when compared to other people at Yavneh). For the first time in almost two decades, Yavneh campers held their heads up high as our buses rolled into Tel Noar, Tevya and YJ on game days. Some of the 90s sporting highlights include: Mike Schiffer & Ari Sussman winning the doubles title at the Tevya Tennis Tournament in ’94; Jordy Solomon taking the juniors singles trophy at Tevya in ’92; Aliza Hochmann wining singles tourney in ’98; Runnin Rabbis ’93 was victorious at the YJ All-Camp Basketball Tournament (which we learned about when we heard the entire team charge into the agam upon their late-night return to camp! ); Girls softball team, the Running Rebbetzins beats YJ in ’94 lead by Jen Mandel and Hilary Katz; the addition of new basketball backboards in ’92 fundamentally altering Brian Amkraut’s shabbos ball game; John Braidman trying to steal the sign off the YJ main office, getting caught, and ends up cutting the lawn at camp for a month. Throughout the 90s, Yavneh was blessed with dedicated teachers and staff who instilled in campers an understanding, an appreciation and a love for K’lal Yisrael, Eretz Yisrael, and living life Jewishly. Throughout its entire history, Yavneh has always imparted in its campers a love for and devotion to the global Jewish community, and particularly, Israel. As the campers of the 90s made their way through the ranks from Gurim to Kerem, literally growing up at camp, they became the first to have the incredible opportunity to extend their Yavneh experiences from Northwood to Jerusalem with the inception of Na’aleh in 1995. Yavneh’s Israel program allows post-Kerem campers and Prozdor students to continue to grow together as an “aydah” while experiencing Israel and Judaism together on a different level. 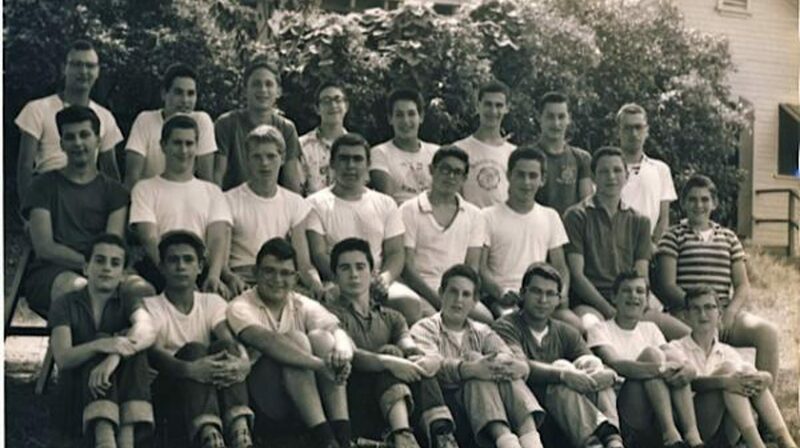 While Yavneh changed in many ways during this decade, and while many moments during those years were unique, the 90s was a Yavneh of which the founders would have been proud, a Yavneh true to the original mission of the camp. Though the buildings are now greater in size and amenities, the walls of the Chadar Ochel still shook each Friday night with the same intense ruach and beautiful (albeit) loud song for the generations that came before. In the 90s, dedicated counselors and roshei aydah, who were once campers themselves, returned year after year to serve as “dugmaot” and older friends to the kids who looked up to them (and would eventually follow in their footsteps). Many campers of the 90s have gone on to become rabbis, teachers, and leaders in the Jewish community. During a time when the world was often changing for the worse, Yavneh grew to embrace a new generation of positive Jewish role models. the song written by Joel Sussman for Yavneh’s 50th anniversary in 1994 says it best: “On and on, dor l’dor, on and on…Yavneh!” Rabbi Dov Lerea started coming to Yavneh in 1994 and stayed for 17 years as our Rosh Chinuch– head of Education and our mashgiach Ruchani– spiritual guide. The new decade brought many changes to Yavneh with the old masoret always deepening. The July 4th parade is still a staple but we now do our own outstanding fireworks at camp, no longer having to go to UNH. Chevrei Safam have played a few of these summers but less and less. Talent shows, Zimriyah, Rikudiyah, Arts festival, Carnival, Yom Yisrael, Mini- Maccabiah, KTV, WYAV, game days-tournaments, a camp-wide cookout on the Maine shoreline, Yom Tiyul, hikes and overnights for every aydah, Kerem putting on musical productions continue, but Leann Shamash has moved on and now Kristi Wivagg directs. Ketsev, a performing group of Arayot singers and dancers that travels to the Boston area to perform, began 6 years ago. In this decade, we have a steady (over) 325 campers each session. Kerem numbers broke 40 in 2004 and stand at mid 40s. Na’aleh has a varying enrollment of about 17-36. We are thrilled that Rabbi Dov Lerea continues at the helm of our Tzevet Morim leading a group of many new and young morim who include some Yavneh alum like Josh Strosberg. Campers continue to learn in the morning. To accommodate our “mvoogarim” we built Ben Zakai, at first affectionately known as “the hotel.” In 2004, we built another adult housing building called Carmel that houses 9 in heated and air conditioned units. We also put a second addition on the chader ochel and put a big extension onto the kitchen. Of course the biggest project of the early 2000’s was Yavnehs’ Big Dig; the State of NH-driven new septic fields which produced new ball fields, a new amphitheater called Tzippori and a new sukkat Bogrim. It really transformed Yavneh. It was also the biggest project Yavneh has ever undertaken! We have added a Kir Tipus (climbing Tower) in the back field where parents now drop off their kids. During 2006-8 the improvements have included a new addition to the office, 4 new tennis courts, the Bat Ha’am being totally renovated, opening of the back field- no more lagoon and a new pavilion where the lagoon was, and many new bunk bathrooms and other improvements along the way. We built a new girls Kerem bunk and 2 new boys bunks in 2008. For 2009 the amphitheater was reconstructed as well as the agam– a totally new look. Yavneh also built a foosball court, a one of a kind at most New England camps! Estelle Gomolka is still with us as Rosh Agam and the banquet mistress. Her agam has been transformed with all new docks and expanded swim space, not to mention the addition of the water trampoline, launcher, and slide. In 2010 the Beit Midrash was built, a beautiful facility housing a library, space for tfillot, the Kerem lounge, and the staff lounge. We moved mifkad again to in front of Beit Midrash, the new center of camp and added Derech Dov. We built a new girls kerem bunk and in 2014 a new boys Kerem bunk. People could contribute to Yavneh by buying bricks in honor of various people or things at Yavneh. In 2013 the old Ben Zvi was ripped down and in the same location a new Ben Zvi went up, which is quite beautiful and functional. Other “lifers” that are still contributing to Yavneh in so many ways are: Lisa Rubins: (Rosh Tochnit), Davida Amkraut (Rosh Banot), The Polirer family who have been here on and off since ’87 Suzie, Rabbi Richie, and various children, Debbie Forman. Rivka and Avi Zablocki, Teri Aronowitz, Korinow’s, Cheryl Harris, Vicki Benedek, Miri Kessar, Fran Amkraut, Frieda and Irwin Shear, Yehudah Potok, Saul Strosberg, Ruth Ehrlich, Chip Belyea, Jackie Shina who had been at Yavneh for many years each have stopped coming in this decade. Meir Deutsch, our Rosh Banim, started coming to camp in 2007 with his wife Adina and now their 4 children! Our 10 year club membership this summer at camp was over 50 people- unbelievable. We also give out at least 80 5 Year Club bags to our campers. Programming wise we added Powderpuff football for Leviim- Maalot girls, ketsev a performing group for Arayot, a basketball seniors tournament at Yavneh, a track meet at Yavneh, great overnights and hiking at the Highland Center in NH, a trip to Acadia in Maine, white water rafting trip, Yavneh for a Day for prospective campers, and so much more!! Jeff Weener (current Assistant Director) began coming to Yavneh in the late 90s as well as our mashgiach from Israel, Rika Deutsch, who stopped coming in 2009. Shabbat, with the addition of ReLiSh is always a highlight of camp. New programs in the 2000s included Trek Yavneh, a weeklong outdoor hiking program for Yavneh and non- Yavneh alike. That only lasted 2 summers. We have also experimented with an Adult Art camp after camp was over- also 2 years. 5 years ago we started Family Camp after camp so that families could enjoy the Yavneh fun. It has been a huge success. Yavneh continues to rent out its facilities to various groups like Prozdor, and various synagogues and even for Bar/Bat Mitzvahs and weddings! In 2012, in a historic moment, Yavneh separated from Hebrew College to become its own official entity Camp Yavneh Inc. We have weathered many summers where there have been wars that Israel had to contend with and we were always there in spirit to support her. 2015 will find Yavneh including Yachad as an important part of our camp. Yachad is a program for Jewish children with disabilities who will be integrated into camp and the bunks with a shadow counselor. From 2010- 2017, in so many ways, Yavneh remained the same place it has always been filled with familiar faces, lots of ruach, meaningful programming and happy campers. Davida, Meir, Benzi, Estelle, Jeff and Lisa are among the staff that remain at camp creating continuity and ensuring wonderful summers for everyone. Yet, there have been many changes as well. In 2010, the new Beit Midrash became the center of Yavneh. With this air conditioned building our madrichim and chanichim enjoyed more indoor space for activities (which were especially appreciated on rainy days) and camp gained a cheder morim, a bigger moadon tzevet, and a new and improved Kerem lounge (affectionately referred to as either the ‘Kmo’ or the ‘Klounge’.) Kerem 2010 (also known as 2KX) left Yavneh with many new traditions, including Kerem banot wearing white dresses on the first and last Shabbatot of the summer, lining the path to the Chadar Ochel to high five the chanichim on the opening day of each session, and having a Leviim through Kerem tisch on the last Friday night of the summer. Also in 2010, Yavneh was victorious in the inter-camp basketball tournament, beginning this decade of Yavneh with a feeling of camp-wide unity. The summer of 2011 was filled with the usual Yavneh spirit. Some highlights of 2011 included a 41 person Na’aleh, the last year of the Maalot Hafta’ah, and Yavneh winning the basketball tournament again, this time on a buzzer beater shot by an Arayot camper. Zimriyah was especially competitive, leaving Kerem 11’ so upset after they did not place overall, that they drafted an entirely new Zimriyah scoring system, which was implemented the next year. Additionally Kikar Leah, was moved from outside the Chadar Ochel, to outside the Beit Midrash. Mifkad now happened further away from the Kerem and Maalot boys’ bunks and closer to the center of camp. 2011 also brought a new masoret for weekday Birkat Hamazon, as Birkat Hamazon was now projected on a screen in the Chadar Ochel. Maccabiahbreakout was a real surprise, happening three full days before Maccabiah was actually set to start. Lastly, 2011 was Rabbi Dov Lerea’s final summer as rosh chinuch. Rabbi Dov’s legacy was later honored by the building of ‘Derech Dov’ outside the Beit Midrash. In 2012, the most notable physical change was the new and improved Ben Tzvi, built in the exact same spot as the old Ben Tzvi. Pieces of the old Ben Tzvi were auctioned off as memorabilia and today remain scattered among Yavneh alumni. Zimriyah also brought changes as aydot were required to sing a shir zemer, and were given the choice of singing either a shir chasidi or shir Yisraeli (in addition to the usual shir aydah). The winners of Zimriyah were Kerem 12’ who won Zimriyah for the 4th year in a row and Leviim. Along with the implementation of shir zemer, came changes in Yavneh Shabbat. Halfway through the summer, post Friday night dinner zemirot were moved from the Chadar Ochel to Ben Tzvi and were preceded by slow zemirot (many of which had been shirei zemer at Zimriyah). In 2013, Rabbi Yehuda Potok rejoined the Tzevet and began teaching Kerem kitot. Women began leading Kabbalat Shabbat for the first time in Yavneh history and a semi regular partnership minyan was instituted during tefilot on Torah reading days. Jeff Weener continued to lead camp as the associate director. Additionally, there were all the usual Yavneh peulot including a hilarious KTV as well as the annual Kerem Karnival, an Achla Yom for younger camp, run by Kerem. The summer of 2014 celebrated Yavneh’s 70th anniversary. 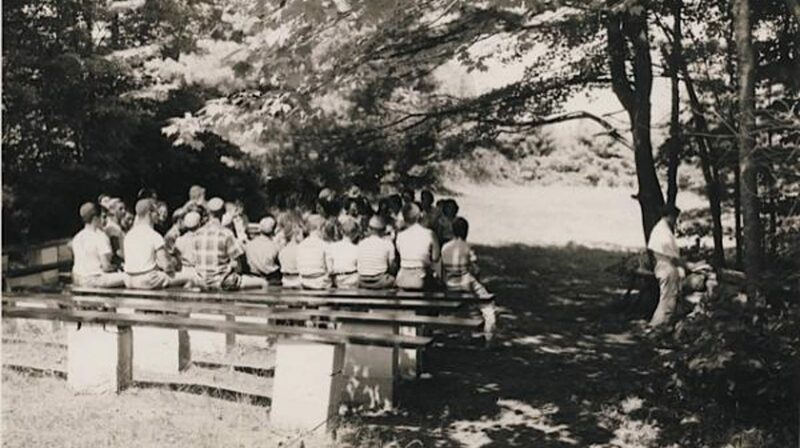 Prior to the beginning of camp, the first ever Yavneh alumni Shabbaton was held. The weekend reunited old friends who enjoyed spending a Shabbat together at camp as they did back when they were chanichim. To further celebrate Yavneh’s 70th year, each Saturday night at the campwide gathering at Tzipori, Debbie shared an old story of Yavneh, and in a nod to the past, the songs for Zimriyah’s shir aydot were selected from shir aydot that had been used in the previous 69 years. The new Kerem boys’ bunk complete with two bathrooms, outdoor showers, and a porch swing was built in the place of the original Maalot boys bunk, and the old Kerem bunk became the Maalot boys bunk (don’t worry all the plaques were taken out of the old Kerem bunk and put into the new one and all the Maalot plaques were put into the ‘new’ Maalot bunk). During Maccabiah, a big change in Yavneh masoret was implemented. After the building of the new Ben Tzvi, it was a challenge to fit both plugot into the building to sing their songs, so beginning in 2014, on the night of Lechu Neranena, tekes would happen first followed by shelet, and then the entire camp would move to the Beit Am to sing. In 2015, Yavneh added an inclusion program called Yedidut. For the first time, campers with special needs were included fully in the bunks at camp, supported by specially trained madrichim. This summer also brought Ashley Marx to camp for the first time as Yavneh’s yoetzet (social worker). Davida celebrated her 20th summer as Rosh Banot! Sadly, 2015 was Hoffman’s last summer on staff. The annual campwide Arts Festival took place at Yavneh with a beautiful performance put together by Marcello and Benzi. Estelle celebrated her 40th summer at Yavneh with a full on banquet night peulat erev all about Estelle! The summer of 2015 ended with Debbie announcing that she would retire after the summer of 2016. 2016 was bittersweet for Yavneh as it was Debbie’s last summer as director (and Joel’s last summer leading musaf). Throughout the summer various peulot were planned to celebrate Debbie. Most notable, was “Yom Debbie” held on July 3rd. Yavneh alumni were invited to camp for the day for a huge celebration complete with a parade throughout camp and a nighttime concert performed by a multi-generational Yavneh band. Yavneh also undertook the writing of a new Torah which was dedicated by singing and dancing throughout camp. Yom Lisa was celebrated to honor Lisa Rubin’s 40 years at Yavneh. Finally, some new firsts included night time programming for madrichim called mad kef and two Kerem roshes! The summer ended on a high note with a final celebration for Debbie on the last Shabbat topped off by Joel’s best musaf of all time. 2017 ushered in a new era for Yavneh with Bil Zarch as director. Bil came to Yavneh with many new exciting ideas such as an elective in the afternoon called sadna (some options were water skiing, basketball and golf!!) and an Israel seminar for Kerem led by Justin Cammy. Buildings were updated including the inside of the office and Weitzman. ReliSh this summer had a vintage vibe with Saul Strosberg returning to camp to sing the classic ReliSh tunes (as well as to be a moreh). Meir stepped up this summer to lead musaf on Shabbat and lead camp beautifully in the classic Yavneh musaf nusach every week. The summer concluded with the announcement that there would be a new aydah added to Yavneh for the summer of 2018 – Gefen! We are always planning and changing but our mission remains constant: a K’lal Yisrael, educational environment where Hebrew is spoken and our kids are all loved and well taken care of.